"HAVE FUN AND MAKE MONEY"
Address: Playa Hermosa Have Fun & Make Money - Room to Expand! Playa Hermosa Great money Maker - Room to Expand! 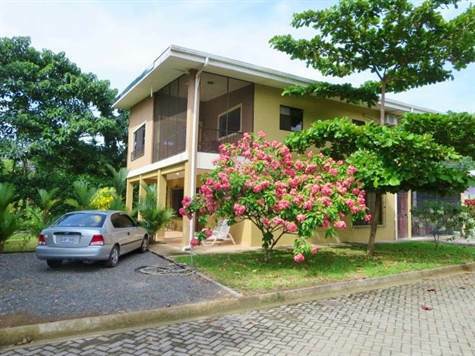 Excellent income producer, vacation rental property, or full time residence with rental income. The property consists of a larger upstairs 2 bedroom 2 bath residence with spacious open floor plan and roomy living area that opens to large terrace and porch for outdoor entertaining. Downstairs is a second spacious 2 bedroom 2 bath residence with covered patio for BBQ and enjoying the Breezes. 2 car garage which could be converted to additional rental unit to increase income plus separate storage areas. There's plenty of land space for expansion. Construction plans have been approved to built an identical building with 2 - 3 additional Rental Units plus center swimming pool and recreational area. Care free absentee ownership is available with the professional property management offered by the Boutique Resort located just across the street. The Property is currently managed by the Resort and both units are well established and popular vacation rentals that show an excellent rate of return. As part of the Resort's rental management program the condos enjoy use of their beautiful swimming pool, rancho, restaurant and common areas.